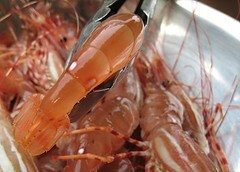 With all interest in eating locally the past couple of years, spot prawns have been pushed into the limelight. The Chefs' Table Society features the creature, hosting the first ever Spot Prawn Festival last year. They have organized another one this year and the opening salvo was set for a Saturday, the 3rd of May. We didn't go to Granville Island that Saturday to hobnob with local celebrity chefs. (We didn't go last year either.) It would probably have been very crowded and parking -- our arch-nemesis-es-es -- would have been horrendous. 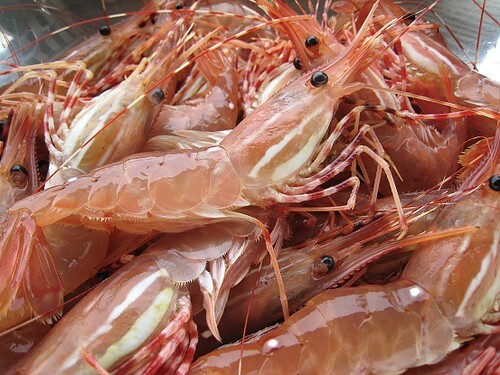 Never the mind: we don't really need a festival to get us excited about spot prawns. We'll get them prawns somehow, some way. I must say, I did something way KEWL-er anyway! But that will reveal itself in time. I've been eagerly anticipating the arrival of the spot prawns. There is something to be said for eating seasonally. Seems like there's greater joy in the anticipation and delayed gratification. The ephemerality is also a part of the pleasure. 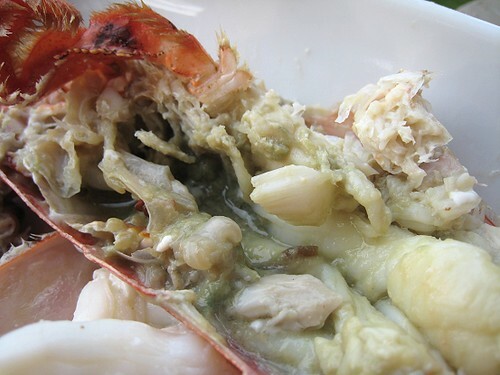 Last year, when it was spot prawn season, we gorged on the prawns until we could gorge no more. The two-month gorging was enough to last us through the year. We wound up at our local Chinese supermarket the next day on the lookout for spot prawns. When I got there at around 10am, there were five empty tanks. I peered at these empty tanks. In one tank, there were 3 little puny prawns. In another, there were 4 puny prawns. 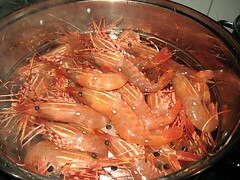 I was trying very hard to squelch panic at the thought of not having spot prawns. I walked around the store, thinking to myself, trying to get my bearings. Don't tell me they already sold out of the prawns for today. Unless they don't have the prawns. That's impossible. How can they not have them? This is where I always buy them. They must have sold out already. I'm too late. I should have come yesterday. It's early still. They can't have sold out already. All they have are 7 puny prawns. What am I going to do with that 7? I might as well not buy any. Come on, where are the prawns?!?!?!! Finally, after deciding there's no point spinning my wheels, I asked the people in the seafood department if they are going to have any more prawns coming in that day. My Chinese is paltry so there was a lot of gesturing at the empty tanks. I was first told more prawns were coming in that afternoon. I started to walk away, rescheduling my day in my head to come back that afternoon, but then there was no time mentioned, so I thought I better make sure what time. I asked the person again and he said about 11 or 12. Armed with that piece of information, I decided to walk around the supermarket some more and get all of the other items I needed. I figured I'd be back at noon. As I was walking around, the person I asked at the seafood department waved me over. "Hey, the prawns will be here soon. Maybe 10:30." After a couple of minutes, he waved again. "They're here. They're just unloading." After a couple of minutes, they proceeded to dump all of the prawns in the live tanks. Wow, they're all wriggling and a sea -- or a tank -- of beautiful orange. I asked for seven pounds of the prawns from the counter person and off our merry way we went to enjoy ourselves some spot prawn goodness later that night. Oh, the lobsters are an afterthought. 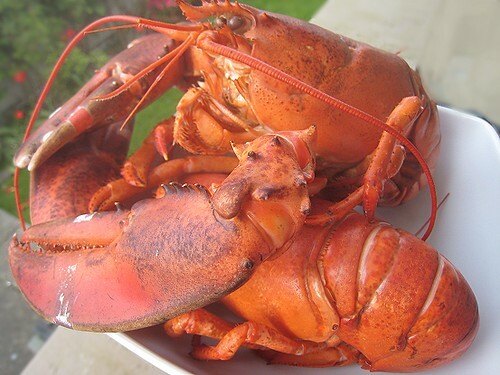 We just got lobsters because we thought some people might enjoy the lobsters more. But for me, it's all about the prawns. This may be the easiest feast yet. Our weapon of mass destruction, the massive steamer. Since we had 7 pounds of prawns, we had to steam them in batches. Good thing the steamer had two levels. We just sprinkled them with a little bit of shiaoxing wine. 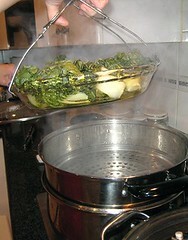 We also decided to round out this seafood feast by steaming some bok choy. 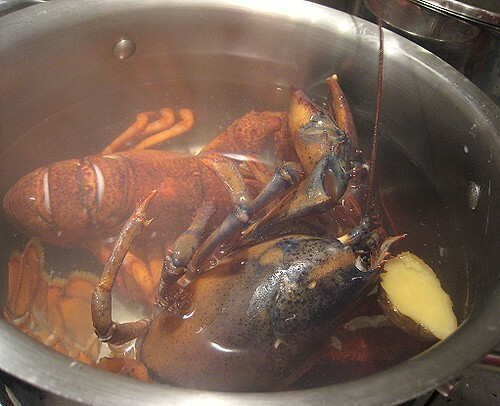 We couldn't wait for all that batch-cookery to finish, so the lobsters had to forgo the steam and went straight into water. 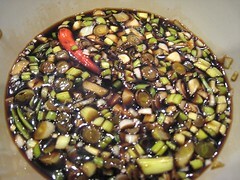 They also had a little bit of shiaoxing wine and ginger in their bath. 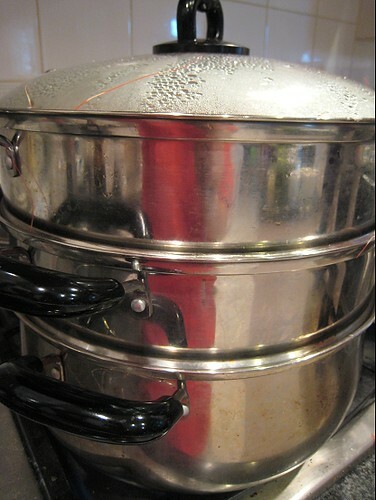 How to get hot steaming plates and dishes out of the steamer? Why, like this, of course! 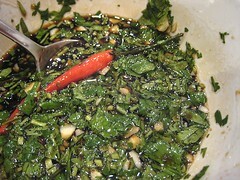 I made some soy sauce dipping sauces: one with garlic, chile pepper and cilantro, the other with garlic, chile pepper, green onions and ginger. This is almost always how we enjoy shrimp when they're in season. 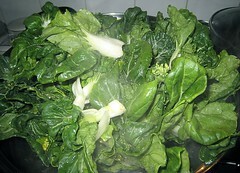 Steamed, they are plump and juicy and very sweet. They don't need anything else! If you feel so inclined to dip them in sauces, just dunk them in for 30 milliseconds. Please, please, please, please don't overpower their shimp-y goodness. not sure what you're talking about in that last post about not having good photo skills. those shrimps are making me salivate! I ALSO get a laugh about the term "prawn." For over fifty (50) years, I have been catching, cooking and eating SHRIMP. Then some "marketer" comes along, and tells us that the "really big" ones are better . . . and that THEY are called "prawns." Then, the "marketer" can charge more for the "prawns" than he can for the "large/jumbo shrimp." After the rant, I feel better. Love your blog. Actually prawn means large shrimp. 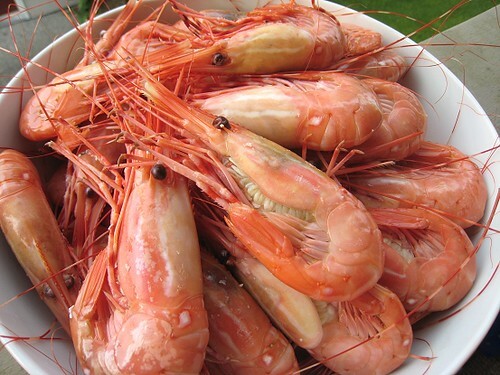 Here in England what you call prawns is what we call shrimp and vice versa. Google Morecambe Bay potted shrimp and you'll see.